I wanted a simple 100% cotton duvet set. I chose the soft gray color which is a very pretty neutral, a silver gray which will blend well with other accent colors. The fabric is very nice and well finished. The button closure for the duvet folds under giving it clean lines. The fabric is soft has a nice sheen, the shams are also well finished. I will buy an additional color of this duvet set to switch them up. Recommend this set if you want a quality 100% cotton duvet set that is also anti allergen at a very reasonable price. 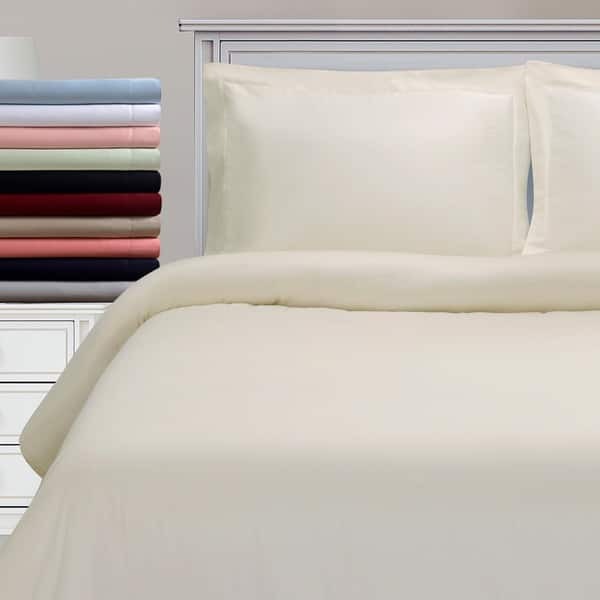 Relax into a cool and restful night's sleep in our high quality 300 thread count antimicrobial duvet cover set. This duvet set has been clinically tested to protect you against dust mites and allergens. Athletes as well as allergy sufferers can appreciate the allergen reducing, antimicrobial, and odor resistant elements, and will sleep with confidence because of the Sanitized Quality Seal. Nice, crisp duvet cover for our queen bed. This cover finishes off the clean look of our bed and is very good quality. Exactly what I was looking for! I haven't put this over a comforter yet nor have I washed and dried it yet. The color is very good except its a little pinker than my lamps but I think it will be ok as i have something else that will cover it when no one is sleeping. The price was excellent and I am confident the quality is as well. All in all i feel this is a good purchase and I will be pleased with it. We order this duvet cover set for a client and it turned out so much better than we thought it was going to beat! The hand is really nice and it soft and washed well. I would highly recommend this to anybody out there looking for something cost-effective but beautiful. The duvet is true to color light silver and soft with slight sheen. The material is fairly limp and sham flange droops which is my only complaint. I bought this duvet cover for my daughter's first big-girl bed. The peach color is very pretty and I was pleasantly surprised by how soft it is. I've only washed it once, but it washed up nicely. The ivory color is very nice and the material is smooth and soft to the touch. It has made a nice neutral color for a duvet that can be used as a bed cover or under a decorative quilt. While there is nothing wrong with this duvet set, the color (coral) is quite different from the picture depicted. It is much brighter and more of a pink/rose color than shown. The color is good, but the fasteners are somewhat difficult because they are located on the corners whete it always sticks when you push the comforter in. "Does it become scratchy and pill? Does it shrink? Thank you"
Following the care instructions provided this should not shrink or pill. "Are there clips inside the duvet to hold the insert?" There are no clips on the inside of this set. "How is this made antimicrobial? is it treated?" i wanted a cotton duvet cover but at a good price. i think this will be jut fine. and it also came in the best color for my decor, peach. "Are there corner ties to tie to the duvet?"